Made with the finest materials, our Classica Travel Toiletries Organizer is the perfect bathroom pouch on the go! Its main compartment and various slots are perfect for holding bottles, facial wash, toothbrush & paste and even beauty essentials. Make this handy organizer your travel buddy today! Need a portable organizer or pouch for your small personal items? Small and beautiful, our DailyLike Mini Cosmetic & Toiletry Pouch is a great fit! You use it as a mini bag-in-bag organizer, cosmetic holder or toiletries pouch! It holds essential items such as cards, beauty products, lipsticks and moisturiser easily! Coming in 4 classic design, it’s great for daily carry or as an add-on for your travels! Have plenty of toiletries, cosmetics and beauty accessories to bring along? Well, the Le Fleur Essentials Carrier is all you need to keep your essentials organized! It features a spacious main compartment for moisturisers, make-up, bathing product and more! 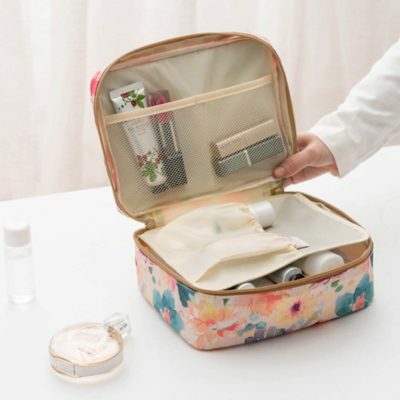 With a classy floral exterior and plenty of pockets on the inside, our Le Fleur Layer Organizer is a bestie to your moisturisers, creams, make-up, bathing products and other beauty essentials! It features a unique layer divider for added hygiene and more storage. Be sure to bring this multi-purposes pouch to your next adventure! Classy, timeless and well-made are words that can be used to describe our Le Fleur Toiletries Organizer! Its name translates to “The Flowers” in French. With plenty of pockets and slots, your travel toiletries can easily be organized neatly. Besides, it features a hanging foldable design for easy access! If you love classy prints, you will certainly love our Le Fleur Toiletries Organizer – Bring it along for your next holiday! Sleek and simple, our Minimalist Toiletries Organizer is perfect for those seeking to combine style and function! With a spacious main compartment, you can easily store a small towel, body wash and other toiletry essentials. 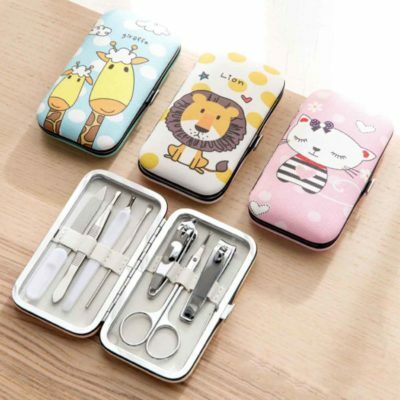 Besides, it features smaller zippered compartments for smaller items such as a shaver, toothpaste and toothbrush. Perfect for travelling or for sports, say good-bye to toiletry mess today! Sleek, compact and simplistic, our Minimalist Toothbrush Travel Holder is a perfect way to carry your toiletries! From your brushing essentials to combs and dental floss, store them neatly and keep them protected with ease today! Just like its name suggests, our Multi Compartments Organizer features plenty of compartments for all your beauty and toiletry needs! Simply fit the compartments according to your requirements, add in your essentials and you’re all set! Besides, it has a elegant design to accompany you on your trip! 4 x Pockets which you can adjust according to your needs! In love with pastel colours? Well-designed and unique, bring along our Pastel Toiletries Organizer to keep all your toiletries and beauty essentials organized – in style! Moreover, it features a special inner pouch and 4 elastic band to hold smaller items in place such as creams, contact lens holder and cotton buds! Be sure to bring this lovely pouch along for your next trip! Browse our Pastel Picks if you love all things pastel! 200ml design is currently out of stock & under backorder! Pre-order yours by making a purchase to be entitled to product reservation & priority shipping! Available by 1 May 2019, view our FAQ page for more details on backorders. Make your makeup process easy and hassle-free with our Skincare Pump Dispenser Bottle! Perfect for toners, makeup removal and other beauty essentials, simply press down lightly with a cotton pad to dispense! Promo: Save 8% with a 2-piece promo! 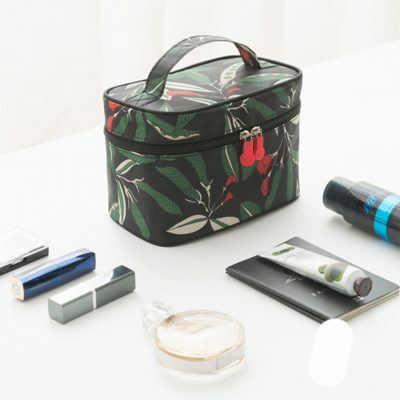 Whether you are heading for a quick get-away or a much-awaited holiday, The Modern Toiletries Organizer is a great way of storing your bathroom essentials. From toothbrush and paste to body soap and beauty essential, keep then neat, tidy and hygienic today! In a hurry to travel? Our Vely Drawstring Cosmetics Bag is the quickest way to store and organize your cosmetics! Simply place your beauty essentials in the pouch, tighten the drawstring and you are all set. It’s that easy! Besides, it is light-weight & splash-proof to keep your essential protected during your travels. Now, traveling with your must-have accessories is no longer a chore! Compact and slim, our Walnut Purse Mirror is a must-have in every woman’s cosmetic pouch! Easily touch-up your makeup on the go by simply rotating it to open and close. Made with quality walnut wood, this exquisite makeup mirror will make you look good anywhere you go! Adorable and functional, our Zookeeper Nail Clipper & Grooming Set is a must-have accessory at home or while on your travels! This 6-piece set features everything you need to keep your nails trimmed beautifully and keeping yourself groomed. It also comes with a compact holder to for added organization and portability!